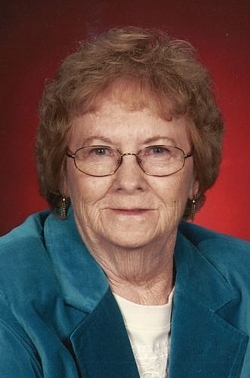 Shirley A. Cummins, 86, of Maquoketa, Iowa, died on Saturday, May 24, 2014 at Clover Ridge Place in Maquoketa, Iowa. A celebration of Shirley's life was held at 11:00 a.m. Thursday, May 29, 2014, from the Carson Celebration of Life Center in Maquoketa. Visitation was held from 4 to 7 p.m. on Wednesday, May 28, from the Carson Celebration of Life Center. Burial was in the Mount Hope Cemetery, Maquoketa. Shirley Ann Brown was born on April 29, 1928 in Jones County, Iowa to Grover and Mary Francis (Flannagan) Brown. She grew up in Jones County and attended school often by horseback at Clay Mills, Temple Hill, and Onslow, graduating from Independence High School in 1946. She married Jacob P. Appelhans in October of 1948 and to this union four children were born, Pamela, Dennis, David Joe and Debra. She married Stanley C. "Stan" Cummins on August 26, 1977 in Galesburg, Illinois. He preceded her in death on January 23, 2002. Shirley was a mother of four children and had also worked at Clinton Engines in Maquoketa for twenty-eight years as a rod bore operator and later as a tool crib operator. She also helped run "Jake's Tap" in Monmouth from 1967 to 1972. Shirley was a member of Sacred Heart Catholic Church in Maquoketa, and the Catholic Daughters of the Americas Court St. Raphael #1156. Shirley was a hard worker. She enjoyed going to garage sales, horses, refinishing furniture and collecting Fiestaware. Those left to honor Shirley's memory include her children, Pam (Dean) Spain of Maquoketa, Dennis (Kathy) Appelhans of Monmouth, David Joe Appelhans of Ankeny, and Debra Hart of Maquoketa; two step-children, Margo Park of Punta Gorda, Florida, and Tony (Stacy) Cummins of Sarasota, Florida; four grandchildren and nine great-grandchildren. She was preceded in death by her parents, her husband Stan, two brothers and two sisters.